2/22/2017 – Although the games were harder fought this round compared to the previous anemic one, only three games out of nine ended in a decisive result. Nakamura seemed to have excellent chances against co-leader Mamedyarov, but in the end drew. Adams bounced back from his bad loss to Mamedyarov yesterday, and overpowered Hammer, while Grischuk and Jakovenko both broke their four draw streaks with wins over Eljanov and Riazantsev respectively. Full report with fascinating analysis by Alex Yermolinsky. The time control in the GP tournaments is 100 minutes for the first 40 moves, 50 minutes for the next 20 moves and then 15 minutes for the rest of the game plus an additional 30 seconds per move starting from move one. The first leg, in Sharjah, will be held February 18 - 27 (with a rest day on the 23rd) at the Sharjah Cultural & Chess Club. The first prize is €20,000; the total prize fund is is €130,000. Friendly handshakes before the game, but don't kid yourself. That is where the friendship ends. 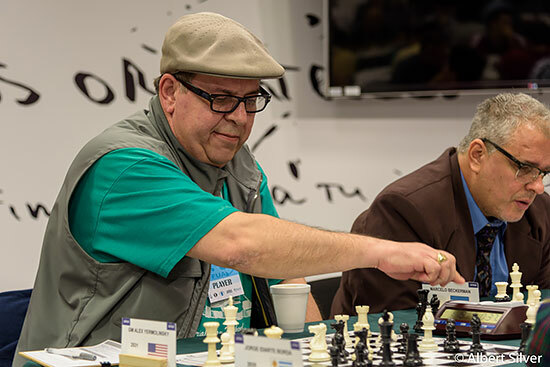 It was a rough day for Alexander Riazantsev (above), who hoped that he could reproduce his memorable win over Jakovenko from the Russian Championship. Alex Yermolinsky recounts the dramatic game that helped clinch the title for Riazantsev. "These two met in the last round of last year's Russian Superfinal. If memory serves Riazantsev was in a share of first with Fedoseev half a point ahead of Grischuk, Tomashevsky and Jakovenko himself. The stage was set for drama, and the drama ensued. Grischuk and Tomashevsky win their games, while the young Fedoseev gambles and loses to another youngster Oparin. In the meantime our heroes play a topical line of the Caro-Kann..."
Alex Yermolinsky chose the games to annotate and in his analysis of Grischuk's win over Eljanov, will not hesitate to cite from memory Pillsbury, Tal, Fischer and Anand and Carlsen for good measure, and what their connection to the game is. AGON is offering exclusive pay-per-view video of the games and live commentary. It comes in three packages: a one-time $10 fee just for Sharjah GP, a full package of all the events in the World Championship cycle for $30, and a $250 package, which is the same as the $30 Base but comes with signed posters from each event. For more information, see the widget on the main page. Good to see direct eye contact between MVL and Aronian during handshake. Don't see that too often between chess players. @weerogue yermolinsk has to make himself clear. you can write like that on your twitter account but here it is different. Thanks for this! 7 move draw aside, I'm not sure I understand Yermolinsk's assertion that these two are 'bosom buddies'. Is he suggesting that Jakovenko allowed Riazantsev to beat him at the Russian Champ's and that Riazantsev returned the favour here?